New research has found that adult sea-turtle migrations and their selection of feeding sites are directly influenced by their past experiences as little hatchlings adrift in ocean currents. When they breed, adult sea turtles return to the beach where they were born. After breeding, adult sea turtles typically migrate several hundreds to thousands of kilometres to their feeding habitats. However, there has been little information about how turtles chose their feeding sites. For example, some turtles migrate to feeding habitats thousands of kilometres away, while other turtles don’t migrate or feed in the open ocean. The study, which involves the University of Southampton, looked at what habitats the turtles would have experienced as juveniles. New-born hatchling sea turtles are too small to track with satellite tags. However, when they emerge from their eggs, they head to the ocean and drift with ocean currents to their juvenile development habitats. 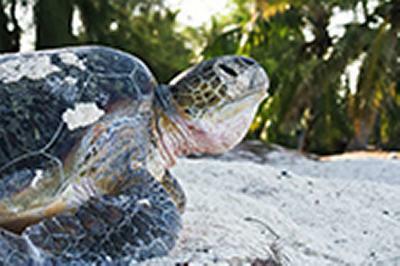 The researchers combined all the available satellite tracking data on adult turtles with models of how the world's sea water moves past nesting sites to study where the hatchling sea turtles drift to. By comparing global patterns in the migrations of all satellite tracked sea turtles with global hatchling drift patterns, they showed that adult sea turtle migrations and foraging habitat selections were based on their past experiences drifting with ocean currents. Dr Rebecca Scott, who led the study soon to be reported in the journal Ecology, says: “Hatchlings' swimming abilities are pretty weak, and so they are largely at the mercy of the currents. If they drift to a good site, they seem to imprint on this location, and then later actively go there as an adult; and because they're bigger and stronger they can swim there directly. “Conversely, if the hatchlings don't drift to sites that are suitable for adult feeding, you see that reflected in the behaviour of the adults, which either do not migrate or they feed in the open ocean, which is not the normal strategy for most turtle species,” explained Dr Scott, who is based at the GEOMAR Helmholtz Centre for Ocean Research in Kiel, Germany. Many animal groups undertake great migrations, and the process of learning where to go on these travels can take several forms. For example, some juvenile whales and birds learn migration routes by following their mothers or more experienced group members, whilst other bird and insect species seem to be born with the information or a map sense that informs them where they should migrate. However, neither of these strategies works for turtles. Once the adult female has laid her eggs on a beach, her involvement in her offspring's development ends. When the hatchlings crawl down the beach into the water, they are on their own; there is no experienced turtle to follow, and they go where the ocean takes them. The Ecological Society of America is the world’s largest community of professional ecologists and a trusted source of ecological knowledge. ESA is committed to advancing the understanding of life on Earth. The 10,000 member Society publishes five journals, convenes an annual scientific conference, and broadly shares ecological information through policy and media outreach and education initiatives. Visit the ESA website at http://www.esa.org. The study was started during a NERC PhD studentship awarded to Dr Rebecca Scott and supervised by Professor Graeme Hays from Swansea University and Dr Robert Marsh from the University of Southampton. The study was finished during a PostDoc position funded by ‘The Future Ocean Cluster of Excellence’. The drift trajectories of virtual hatchling turtles from the breeding beaches to their juvenile development areas using the NEMO ocean model.